Published Feb. 8, 2018 at 9:02 a.m.
On Feb. 15, Northwestern Mutual Foundation will open what it calls a "first-of-its-kind art exhibit" – free and open to the public – at the new Northwestern Mutual Tower and Commons, 808 E. Mason St., as a means of commemorating its 25th anniversary. More than just showing work by local artists, "Giving Gallery: Community in Process" will also spotlight a number of area nonprofits and the work they do in the community. The exhibit – open weekdays from 8 a.m. until 6 p.m. for a year – will include 26 works by 17 artists with Wisconsin ties. Each artist was paired with at least one nonprofit to help tell its stories and underscore its impact. For example, Shelby Keefe paired with Dominican Center, Metcalfe Park Community Bridges and Milwaukee Christian Center; Eduin Fraga worked with Milwaukee Public Schools and the United Community Center; and Amy & Jonathan Gelfman teamed with Sojourner Family Peace Center. As part of the program, each nonprofit received a $10,000 grant from the Northwestern Mutual Foundation, which, since 1992, has donated more than $320 million – $87 million has gone to the nonprofits featured in "Giving Gallery." "Our 25th anniversary is the perfect opportunity to pause and look back at the investments we've made, the work we've done and the countless lives that have been impacted," said Eric Christophersen, president, Northwestern Mutual Foundation, in a statement. "It's also the chance to acknowledge the incredible partnerships we've fostered in the nonprofit community. We hope the stories of these unsung heroes will inspire those who visit this exhibit to join us in achieving our community's full potential." We caught up with artist Mutópe J. Johnson – who teamed with Big Brothers Big Sisters of Metro Milwaukee and the Boys & Girls Clubs of Greater Milwaukee – to ask him about "Giving Gallery" and his participation. OnMilwaukee: Tell us a bit about your work in the show that will be on view at Northwestern Mutual. Mutope J. Johnson: I had the pleasure of creating two works of art for Northwestern Mutual's "Giving Gallery: Community in Process" exhibit. This gallery, which commemorates the Northwestern Mutual Foundation's 25th anniversary, was created to celebrate the accomplishments of nonprofit partners and the work they've done with the Foundation and each other. The pieces I created represent Big Brothers Big Sisters of Metro Milwaukee and Boys &amp; Girls Clubs of Greater Milwaukee, respectively. 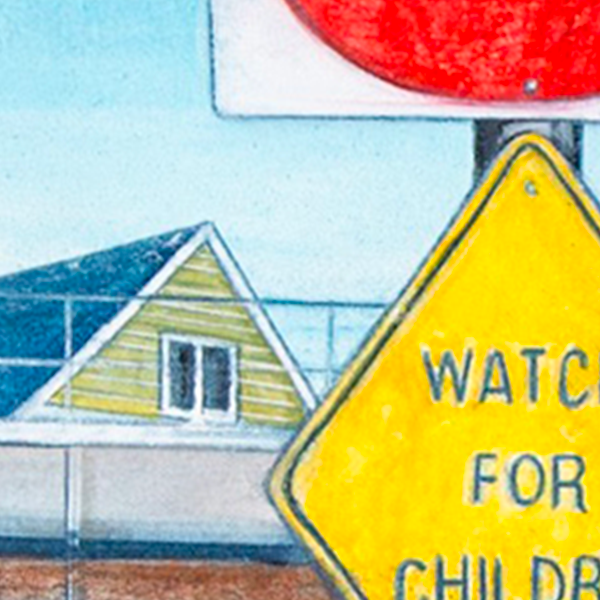 The artwork for Big Brothers Big Sisters of Metro Milwaukee, a watercolor painting, represents the relationship between a big brother and his little sister. We wonder not only who these children are, but will they be safer where they are headed? The painting serves to remind us that on life's two-way street, we are the change they are looking for. My second piece represents the Boys &amp; Girls Clubs of Greater Milwaukee. 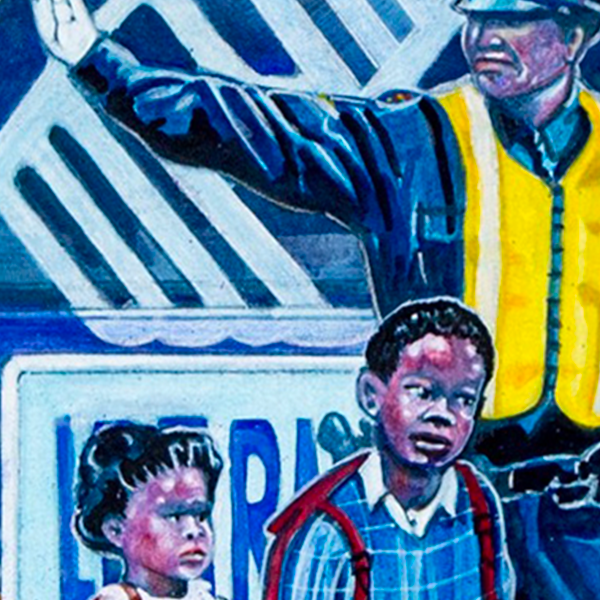 The visual narrative in this painting becomes symbolic of the positive effects of being in a safe community environment that promotes education, leadership, independence and self-reliance even at such a young age. What do you hope having work in this different venue will accomplish? I hope when people see my work in the exhibit, they are both encouraged to become accepting of cultural differences and look for ways to get involved with these -- and other -- incredible organizations. It's important for me to create work with a narrative that promotes creativity, cultural exchange, history and inclusion, and also that inspires action. How did the venue and potential audiences affect your works for the show? I focused primarily on creating specific concepts to address the mission of each of the two non-profit organizations, rather than on the venue or potential audience. Both of my pieces for this exhibit were inspired by the work these organizations do day in and day out, and I'm excited for the community to see them. Do you think this kind of show, in an unexpected place, perhaps reaching an audience that doesn't frequent galleries, will become more widespread here? This is a one-of- a-kind art exhibition in a nontraditional space with tremendous potential. Allowing the audience to feel welcome is central to the experience. One way this project can become more widespread here is if individuals, companies and organizations engage with one another to blend creative strategies, implement project vision and fiscally commit to making our city a better place to work and live long term. It's our hope that the art in this exhibit will inspire these types of conversations and actions. Can it help build bridges in a community like ours? Using the power of the arts effectively can create opportunities to build bridges in a city like Milwaukee. Giving Gallery: Community in Process demonstrates how collaboration enables us to come together and reach our greatest potential as a community. It's also a reminder that there is more to do, both individually and collectively.